A fresh solution every time. AMALGAMATED Instrument Co (AIC) has conductivity calibration solutions available in convenient 25ml sachets. The solutions are available in four conductivity levels - 84μS/cm, 147μS/cm, 1413μS/cm and 12,880μS/cm. These four values allow calibration of a wide range of cells for a wide range of applications from high purity water to boiler feedwater and above. The use of the sachets guarantees a fresh solution every time and allows for quick, mess free calibrations with minimal waste. The sachets can be easily taken into the field and minimise the risks of spillage and spoilage. Each sachet has a conductivity/temperature variation table included to allow adjustment for calibration temperatures that differ from the standard (25°C). The sachets are available in boxes of 10 sachets of each individual conductivity value. 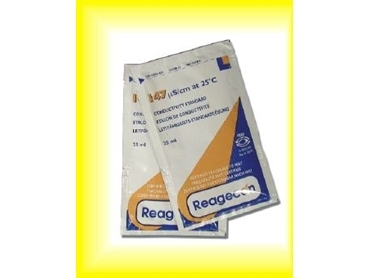 These conductivity sachets join the sachets of pH calibration solution also available from AIC.